Thanks to Mr. Harper, my Canadian passport is worth less than the passport of Canadians born in this country with no ties to foreign lands. 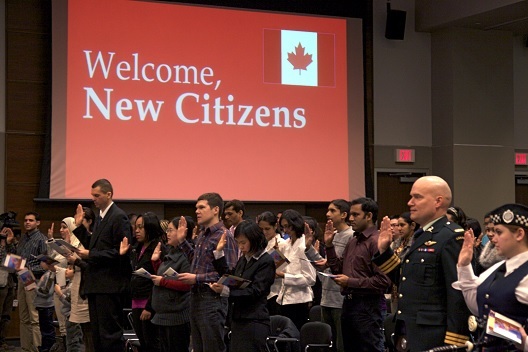 That is because Mr. Harper decreed that Canadians convicted of certain crimes can have their citizenship revoked. Never mind Canadians born abroad… apparently, Mr. Harper believes that even Canadians born in this country can be exiled to the land of their parents under the right circumstances. But if it’s only terrorists, why should I be concerned? Well… remember, at one point, Nelson Mandela was considered a terrorist (and a commie to boot). Being a “terrorist” is often a politically charged accusation. In any case, we have perfectly adequate laws dealing with crimes such as planning or executing politically motivated murders or other acts of destruction. Does this country really need to bring back a barbaric practice more readily associated with past regimes like the Tsars’ Russia, of sending undesirable people into exile? And the ridiculousness reaches Kafkaesque levels when you learn that the government does not need to prove its case that a person is a citizen of another country. Rather, the accused has to prove that he is not. If Mr. Harper really believes that this is the way Canada should operate, I am beginning to wonder if he is actually fit to take care of any kittycats.